It is time to sign up for our first SEP Conference of the year. SEP stands for Student Education Plan and it is a time where the student, parent, and teacher meet together to talk about the achievements the student is making in class and also set some goals. Please sign up using the link below and go to the correct sign up button on Sign Up Genius for your child so you can come and meet with your child's teacher. We will also have the PTA Bookfair open during SEPs so you can stop in and visit the Book Fair that evening as well! Go to the link on our webpage to sign up for a time on October 27th. Mrs. Evans' kindergarten class has been practicing using their listening ears every day. They are learning that they can be proactive and be in charge of themselves. We have a classroom of great leaders. 5th Graders at Barnett Elementary buddy with 1st graders to help them become stronger readers. The 5th graders go weekly into a 1st grade classroom and tutor the first graders for a half hour. Not only does this excite the 1st graders about reading, but it builds empathy and confidence in the 5th graders! Crazy hair day! This week is Red Ribbon Week here at Barnett Elementary! We have been talking about saying no to drugs and alcohol each day. Today our students said "Hairs to a drug free life!" Barnett Bulldogs celebrated our first monthly Bulldog Pride Assembly in September. This was a special Bulldog Pride Assembly for multiple reasons. First, the name of our Bulldog mascot was announced. 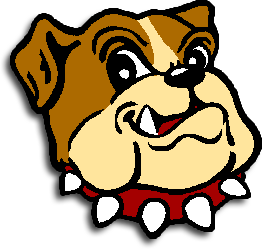 Students voted for the name Buddy the Bulldog! Buddy came out and met the students and helped us to celebrate all of our wonderful accomplishments in the month of September. Finally, we started a new tradition here at Barnett. After our Bulldog Pride Assemblies, students who are Top Dogs or Leaders of the Month get to go on a Victory Run. All other students line the hallways, cheering and supporting students as they join Buddy for a lap around the school to celebrate their victory! Here are our Principal's 200 Club Winners for October 6th, 2016. In 1st Place is Lea Brunger. Winners in Lea's row are Ayden Robinson, McKenzie Mitchell, Taygen Howse, Molly Hixson, Russel Eddie, Mya Rivas, Tyson Barker, Landen Jensen,and Alexis Robinson. Congratulations to all of our Principal's 200 club winners! Keep earning those brag notes to fill up our board again! These students had the opportunity to go have lunch with the Payson Fire Department, see the fire station, and even ride in a Payson Fire Truck! We are so grateful for our local Fire Department for treating our students to this once in a lifetime experience! They are awesome! Please see the attached newsletter below for October.